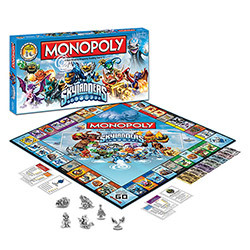 In the Skylanders edition of MONOPOLY you can now by, sell and trade 22 newly discovered locations in Skylands! You can be a chompy, a sheep or even Kaos as you take a ride on Flynn's Blimp Tours or The Molekin Mine Train. Work your way around the board as you battle over Thumpback's Thundering Tide Pool, Chop Chop's Boneyard or Hot Dog's Lemonade Stand on your quest to own it all!